Rainbow Riches is an all-time classic slot, one of the most successful crossovers from slot machines in casinos and arcades to the world of online video slots. From the design studio of Bally Barcrest, its Irish mythological theme means you can expect to find plenty of leprechauns, rainbows and four-leafed clovers on your travels. If you get lucky, there are pots of gold waiting to be won, both in the main game and through the three separate bonus features that can be triggered from the reels. Wins are paid for combinations of matching symbols on any of the 20 paylines. Full details of the paying combinations and their values can be found in the paytable, linked from the bottom right of the reels. The gold coin is the wild symbol in Rainbow Riches. If you land this on the board, it switches for any other symbol except from the scatters to make up combination wins. The leprechaun scatter symbol starts the Road to Riches bonus round, when you land three or more of these symbols. This bonus round takes place on a new reel set, which is a path to riches, laden with a spinning wheel to determine your progress. During this round, you can pick up multipliers and cash wins, which are added to deliver your feature win total. The wishing well symbol starts a pick-me bonus round, where you are offered the choice of one of three wishing wells as the bonus game. Pick one to reveal a multiplier, which will be added to your bet stake and paid as a feature win. Landing three of the pots of gold symbols on the internal reels 2, 3 and 4 triggers the Pots of Gold bonus. A carousel of multipliers spins around the leprechaun’s head and stops to reveal the multiple to be applied to your bet, and paid as a feature win as before. Choose the stake per line in the bottom left hand corner of the main reels screen. Use the arrows up or down to increase or decrease your stake. Then choose the number of paylines you want to play per spin. The per line stake is multiplied by the number of lines in play to calculate your bet per spin. When you’ve set the right bet levels, click spin to start the reels. There’s also the option to ‘autospin’ if you’re set on your budget and you want to play through a longer spinning session. Wins are added automatically, and a bonus game will start if you trigger a bonus feature from the reels – anecdotally, these occur quite frequently, and can lead to some of the most generous payouts from this game. To learn about other high RTP games see our best paying casinos list. Rainbow Riches offers a maximum win of up to 500x. With the maximum per spin bet of £400.00 and 20 paylines, this translates into a maximum win of £10,000. Not bad for a single spin of the game – and even if you don’t win the main prize, there’s still the opportunity across three bonus features for decent feature wins. The Rainbow Riches jackpot is not progressive, although progressive jackpot versions of the game do exist. 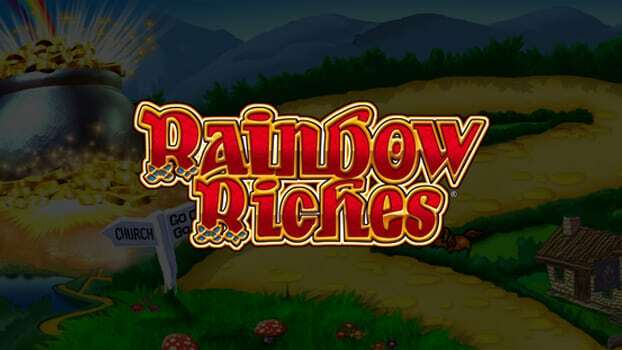 Rainbow Riches graphics are iconic, and instantly recognisable to slots fans or regular players. While they are showing some signs of age these days, the leprechaun in particular is drawn in a distinctive way that separates Rainbow Riches from its inferior copycats. The mystical background music relies heavily on the harp, and you shouldn’t be too surprised if you hear the occasional Irish jig – especially during the bonus rounds. The graphics, music and in-game sounds have a slightly retro feel, but it does nothing to detract from what is a fun, as well as potentially lucrative, slots game. Rainbow Riches has long been enjoyed in pubs and arcades, long before it became one of the more popular online slots games. While there are some elements of the game that could do with a refresh, like the graphics and some gameplay elements, the core game remains as playable today as it was back in 2010. The bonus features and jackpots mean there’s plenty of winning potential here. And with a high RTP at 95.00% and a manageable, medium variance, this is a good slot for beginners and more experienced slots fans alike.